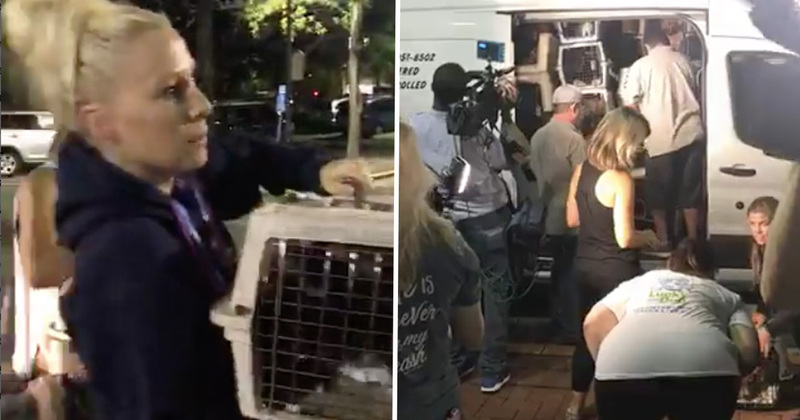 This is the amazing moment a group of people came together to rescue dogs and cats abandoned in a hurricane evacuation. The rescue was a joint effort by Lucky Dog Animal Rescue and PetConnect Rescue, who managed to get 32 animals, 17 dogs and 15 cats. 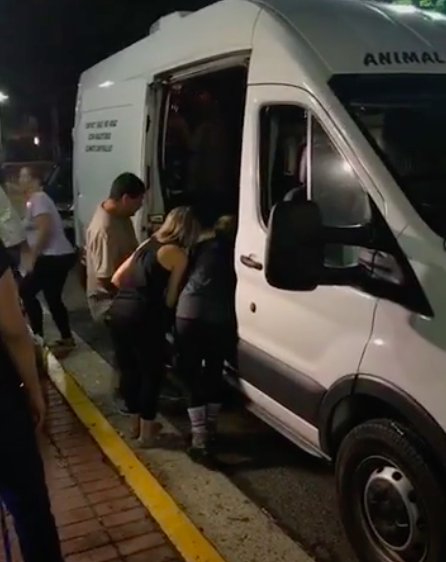 Their van, carrying the critters, broke down 90 minutes into their six hour trip from Florence South Carolina. The call for help went out into the rescue community and dozens of animal lovers turned up to assist. They were then put into the cars with air conditioning and water. A replacement van finally arrived, at around 11:15pm and the animals were then reloaded onto the van. Every animal was welcomed by a pre-approved foster who happily scooped them up and took them to their new foster home. For some of these animals, this is the first morning they ever woke up in a home. Shelters near the anticipated hardest hit areas will try and empty their shelters as much as possible. That way they make room for animals who become separated from their families during the storm or who find themselves stray for some reason. This allows for people to reunite with their beloved pets. In addition, while a normal hold at a shelter is 4-5 days, shelters extend this hold period during these kinds of natural disasters to up to 30 days (depending on the shelter). All their rescues go directly into pre-approved foster homes or into one of two group foster facilities, Muddy Paws Farm or the Hadorn Canine Cottage for senior dogs. They then post their pictures and a little bio on their website. We are part of a large animal rescue online network. People can either go to our website to look at the animals or more often than not. They come to us after finding one of our rescues on petfinder.com or other national pet locator apps. If someone is interested in an animal, they submit an online application. The animal’s adoption coordinator sifts through applications, conducts phone interviews, vet checks, home visits and meet and greets to make sure it’s a good-fit for both the family and the animal. You can never go wrong with rescuing animals. Most end up in shelters through no fault of their own and many of them pay the ultimate price. My advice for those interested in rescue is to first think through what kind of time you have to give an animal. All animals need love and attention and this commitment lasts their entire lifespan. Make sure the animal’s needs are a good fit for you and your family. Then, go for it! You will not regret saving a life. For more information about their incredible work, you can visit their site right here.